Cleaning up after a pet accident, whether it’s dog poo or cat vomit, is an unpleasant task. No one would argue with that. Even after you clean the mess from carpet, can you be sure that it’s really clean? And what about cat urine from hardwood floors? Forget it! However, this is one area where Nature Stone really shines, as its proprietary technology also comes in handy when there’s a nasty pet mess that seeps into the flooring. Like any flooring, if a pet accident occurs, it needs cleaned up right away. However, unlike other flooring, you can clean Nature Stone all the way down to the substrate. At this hidden level, nothing – not even pet urine, vomit or feces – will adhere to Nature Stone. On the other hand, consider how difficult it is to clean pet accidents from carpet fibers and pads or even tile grout or linoleum grooves. It’s impossible to completely flush the matter from the flooring. The same goes for stains, too. 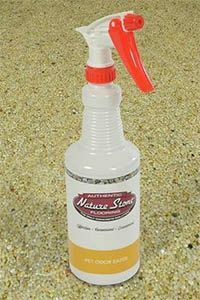 Nature Stone flooring can actually be easier to clean and disinfect, compared to the hassle of trying to remove urine stains, odors, or vomit in other flooring. Saturate the spot with our Pet Odor Eater product, which uses 50 billion microbial colony enzymes to digest organic materials and completely neutralize odors. Rinse the floor with fresh water and use a shop vac to dry the floor. Get the relief you need, knowing that your floors are thoroughly clean and free of pet accidents and residue. Trust Nature Stone flooring. It holds up well, whether your pet is tossing his cookies or relieving himself indoors.